On a spring day embraced with warm sunlight, the 16th New Life Family Walkathon was held to think of our neighbors, while taking a walk together. The footsteps taken by about 170,000 man-days through 15 walkathons make up a distance to walk around the earth 11 times. The laughter, which families shared together that day, brought laughter to our unfortunate neighbors in Korea and in other countries. At 10a.m. on April 26th, about 10,000 family members of the Intl. 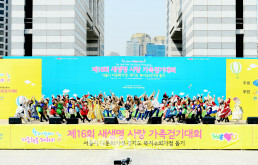 WeLoveU Foundation gathered together at the Seoul Olympic Park. This walkathon was held to help multicultural families and the families marginalized from welfare service. Zahng Gil-jah the Chairwoman of the Intl. 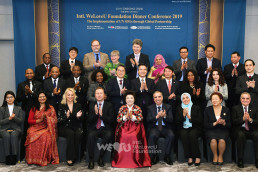 WeLoveU Foundation, Lee Kang-min the Executive Director, Lee Bae-keun the President of Korea Association for Prevention of Child Abuse and Neglect, Ambassador of Tunisia, Ambassador of Iran, diplomatic delegations from the Embassies of Senegal, Colombia, Romania, Cambodia, and Fiji, and about 30 family members of the diplomatic delegations willingly participated in this event, feeling empathy with the aim of this event. Singers like Yun Tae-gyu and Ben also came to share love despite their busy schedule. At about 10:30 a.m., the ceremony started with the cute dance and singing of the New Life Children’s Choir. 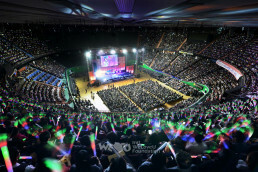 After the performance, a video was played and showed how the members of the Intl. WeLoveU Foundation help neighbors who suffer from poverty, diseases, and disasters with Mother’s heart in various countries, and it drew the participants’ attention. 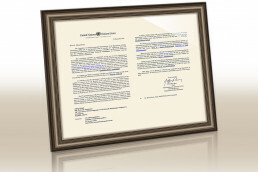 At around 11a.m., the fund delivery ceremony started. 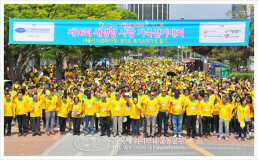 Chairwoman Zahng Gil-jah said, “The love of the participants of the family walkathon has given hope and courage to our underprivileged neighbors around the globe,” and also wished that happiness would be added to all those who walked with their loving family members, and that flowers of laughter would be in full bloom at their homes. She also delivered the heartbreaking news about the great earthquake in Nepal which had happened the day before, and also earnestly asked the participants to help Nepal because what happens in the globe is ours, not someone else’s, and to send love to all the family members of Nepal because we are all one family. Moved by her heartfelt speech, the members responded to her with a big round of applause. H.E. 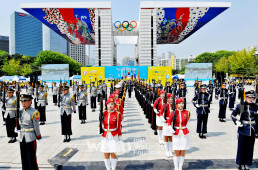 Mohamed Ali Nafti the Ambassador of the Republic of Tunisia in Korea, said in his congratulatory message, “I’m happy and feel honored to be at this beautiful social, cultural, and international event,” and he thanked the Foundation for spreading hope and happiness to many people around the world. Followed by his message, the ceremony to delivery funds was held to support multicultural families and the families marginalized from welfare service, with the cost of living and medical expenses. 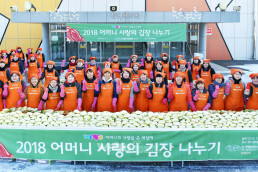 This fund is going to be delivered to 75 neighbors in Seoul and Gyeonggi-do immediately with the help of the authorities. 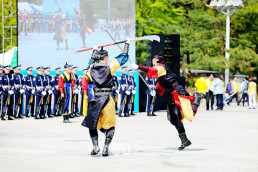 As Chairwoman Zahng Gil-jah proclaimed “start,” the fanfare sounded and the walkathon started. 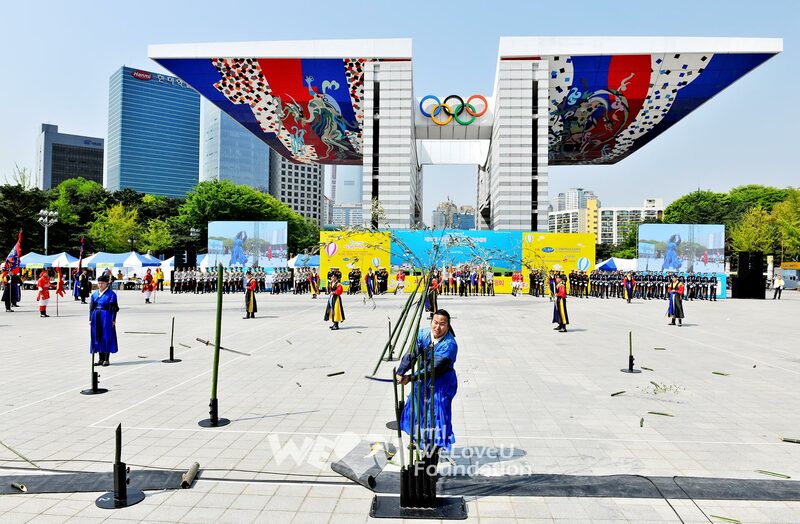 The spring flowers such as royal azaleas were in full bloom in the verdant Olympic Park, giving excitement to all the participants. 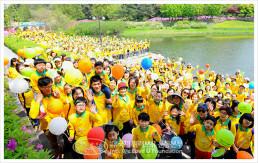 The members in bright yellow T-shirts walked along the path full of spring smell, having a sweet talk with their family members. 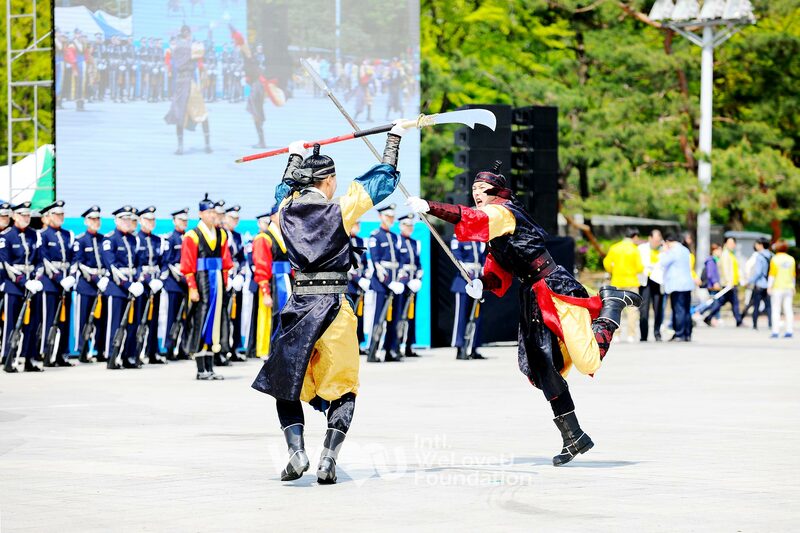 In various parts of the course, many events such as “walking with laughter,” or “walking with compliments” or “messaging each other” were prepared, and they enhanced the family love and unity. All the diplomatic delegations said that they were surprised by this grand event where so many families came, and that they were moved to see them help neighbors with one mind. The Ambassador of Cambodia expressed his gratitude for supporting the regions with scarce water in his country with water pumps; the Ambassador of Fiji praised the Foundation for helping Tuvalu; and the Embassy of Senegal was moved by the Foundation’s support for African countries with scarce water. They all wished for constant cooperation with the Foundation. The love for family was extending as the love for neighbors, drawing worldwide interest and empathy.